“The Chaperone” is a charming film that uses the backdrop of the Jazz Age to tell a story of self-discovery and empowerment. It’s a quietly moving film that, while thoroughly conventional, still manages to engage thanks to a solid script and fine lead performances. Elizabeth McGovern (“Downton Abbey“) plays Norma Carlisle, a society matron and wife of an attorney in early 1920’s Wichita, Kansas. When Norma meets 15-year-old Louise Brooks (Haley Su Richardson, “Edge of Seventeen”) following a dance performance, she’s immediately struck by the young woman’s talent and potential. When she learns that Louise is in need of a chaperone to spend a summer in New York City studying dance, she impulsively volunteers. It’s not long before Norma realizes she’s in over her head with Louise. Precocious and irreverent, Louise rejects every convention most “respectable” women, including Norma, hold dear. While thoroughly nonplussed by her new ward’s attitudes, Norma does her best to keep the teen out of trouble once they arrive in the big city. It’s not an easy task, especially since she has her own personal reasons for wanting to be in New York. Their journey together proves to be life-changing for them both. For Louise, it’s the first major step towards worldwide stardom. For Norma, it’s a step towards something equally grand – a fully-realized life of her own. Fans of that show’s strong writing, memorable characters, and production design should find much to enjoy here. It’s not just the presence of Fellowes, series regular McGovern or veteran “Downton” director Michael Engler. It’s the film’s exploration of societal expectations, of cultural norms and how younger generations come to challenge and re-shape those norms, that echoes much of Fellowes’s prior work. Fellowes’s talent for crafting resonant, fully realized characters also shines here. His takes on the proto-Louise Brooks and the fictional Norma Carlisle feel both period-authentic and relatable to modern audiences. The performers, in turn, take what Fellowes gives them and deliver memorable, if understated, work. Richardson, the rising star seen earlier this year in “Five Feet Apart,” delivers Brooks as incorrigible and mischievous, but not thoroughly rotten. Hers is a controlled performance, one that convincingly evokes the real-life Brooks’s magnetism while keeping the character likeable in her most impetuous moments. But while Richardson plays the woman who stole every scene in real life, in “The Chaperone” it’s McGovern’s character who audiences will cheer for by the film’s end. Norma’s turmoil is instantly recognizable in any era, quietly chaffing against rules and expectations she herself outwardly represents and champions. McGovern projects the anxiety and self-doubt necessary to effectively bring to life that struggle in a relatable way. Yes, Norma is a character borne of an era we’re almost 100 years removed from. Her journey to self-awareness, and emotional liberation as McGovern embodies it, however, is timeless. 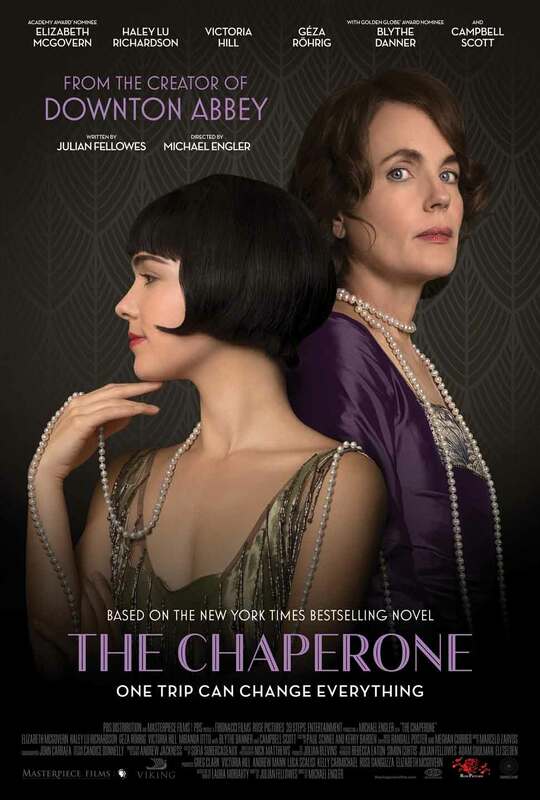 Again, fans of “Downton Abbey” should make time for “The Chaperone,” given the opportunity. After all, we’re getting a “Downton” feature film later this year, so this should serve as an enjoyable diversion until its time to visit with Lord and Lady Grantham once again. Beyond that ardent fandom, audience who enjoy PBS and Masterpiece Film productions should also enjoy what they get here. It’s well-crafted and handsomely shot with terrific period costume work — exactly what you’d expect from its pedigree. Starring Elizabeth McGovern, Haley Lu Richardson, Victoria Hill, Géza Röhrig, Miranda Otto, Blythe Danner, and Campbell Scott. Directed by Michael Engler.